The new building for the BC Cancer Agency is a good addition to Broadway, one of Vancouver’s most ridiculously unattractive streets. 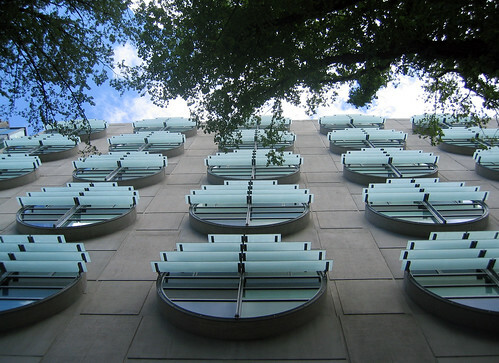 The building’s most obvious feature is its round windows which are meant to reference the glass petri dishes used in cancer research. And they’re functional – you can actually open the window in your workspace and the glass ventilation shutters direct air flow. 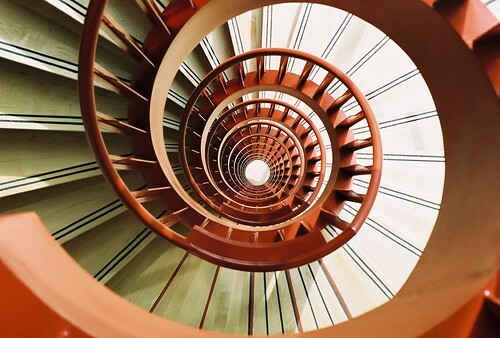 The beautiful 15-storey spiral staircase is designed to resemble DNA’s double helix structure, and the cover of the building’s roof deck is shaped like an amoeba. This type of clever thematic allusion can be very tiresome (remember postmodernism) but here it’s subtle enough that it’s not gimmicky. More importantly, it’s an award-winning green building. As a recent Treehugger article on the building pointed out, it’s water efficient, including the use of waterless urinals, a quarter of the construction and finishing materials were from recycled sources and are low-VOC, and the building is energy-efficient and clean in myriad other ways. 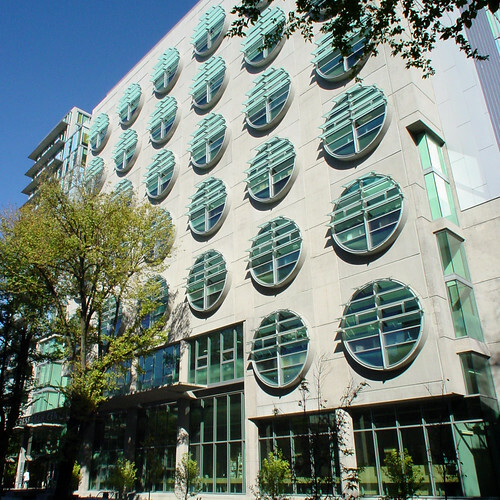 It’s not surprising that it won a LEED Canada Gold rating. 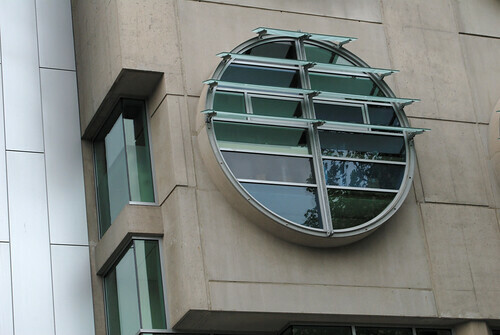 The overall building shape is a little ordinary, perhaps, but the windows really carry it, both close up and from a distance. But the main idea was to create a healthy and creative environment for the researchers who work there. And they seem to like it. Top photo by slightly-less-random; below by Ruth and Dave, jmv and sabel on flickr. More information from canadianarchitect, and click below for more. This entry was posted on Wednesday, January 14th, 2009 at 2:49 pm	and is filed under architect, architecture, British Columbia, Canadian design, cities, design, green, Vancouver. You can follow any responses to this entry through the RSS 2.0 feed. You can leave a response, or trackback from your own site. No, actually, I believe these were all Creative Commons or I got permission, which is what I usually do… but now that you mention it, I didn’t credit these photographers, which I also usually rigorously do on this blog, so I can’t remember why that is. I will have to fix that. You’re not one of these photographers, are you? Accreditation and permissions can be very complicated and I do make mistakes every now and then with so many requests going out and permissions coming in things can get lost in the wash.